A local authority has allocated £1.1 million for carrying out environmental improvements to a number of housing estates, including here energy efficiency features, a recent news report on this matter was able to reveal. Beside energy efficiency improvements, Leicester City Council also plans to improve various aspects related to the houses’ aesthetics and security, while also refurbishing playground equipment in the targeted areas. Cllr Andy Connelly, asst city mayor responsible for housing, said: “By working closely with local councillors and our highways and housing teams we have been able to prioritise a wide range of improvements that will benefit many of our tenants on estates across the city. The HeatSave thermostatic radiator valves are the easiest to install and most cost-effective energy-saving measures on the market. They are particularly suitable for retrofitting, since one simply has to remove the existing TRV and replace it with the HeatSave unit. 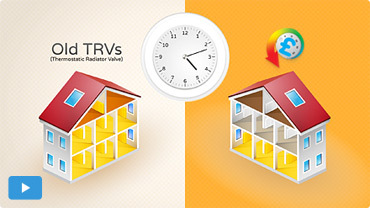 The wireless thermostatic radiator valves enable users to set specific functioning times for each valve, and, since radiators are individually controlled, home owners are fully capable to maximise the zoning potential and reduce energy consumption in those areas that are not used for longer periods of time (as for example, dining or sitting rooms and kitchens during the night, etc.). Additionally, the HeatSave wireless thermostatic radiator valves also provide an automatic exercising feature when unused for 7 days, whose purpose is to minimise seizing of radiator valves in warmer months. All in all, the HeatSave TRVs enable users to achieve some pretty impressive savings, as they will help reduce your heating bills by up to 30%, especially when coupled with the HeatingSave Building Energy Management System. If you want to find out more about the HeatSave wireless thermostatic radiator valves, our dedicated team is eagerly waiting to answer all of your questions.